Frowning upon the practice of frequent adjournments, President Ram Nath Kovind has termed it a sort of “justice tax” on poor litigants and asked the Bench and the Bar to ponder over high litigation cost. “After all, frequent adjournments, often sought only to delay cases, are an inconvenience and a form of a justice tax on poor and less well-off litigants,” the President said at the launch of the festschrift ‘Law, Justice & Judicial Power -Justice PN Bhagwati’s Approach’ here last evening. “When the judiciary attempts to find solutions to the aberration of frequent adjournments, it expands the idea of justice,” he said. The President also disapproved of high cost of litigation. “Litigation fees should not create a divide between haves and have-nots and between litigants who can afford and cannot afford considerable fees. 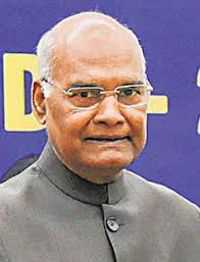 This is an urgent issue for the Bench and the Bar to consider and help resolve,” Kovind said. Both the President and Chief Justice of India Ranjan Gogoi lauded the role of former CJI Bhagwati’s contribution to the jurisprudence of public interest litigation. Noting that Justice Bhagwati “strived to expand the concept of justice and make justice that much more accessible to common people,” Kovind said it was not without reason that Justice Bhagwati had been called the “father of public interest litigation” in India. Justice Bhagwati was more than just a judge and a scholar, the President said, describing him as an institution in himself.